i havnt been doing much art latly, been working on other stuff..
i been itching to submit something new and came up with this piece. sure, as long as you respectfuly not distribute this in any way . i do have larger res wally if you need bigger. 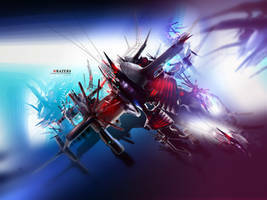 can i use this c4d to propose a tuto on a graph forum to make a sig with this c4d in background? no bro, i cant allow that. theres alot of free renders here for public use n stuff if you search around. id appreciate you being respectful of that, thnx. Wow, freaking awesome. Your gallery is a badass locale for abstract art fans! looks great, love how things flow together. crazy cool or crazy lock me up and throw away the key, lol.. thnx.. Question... I am a "newbie" in this area... how does one get started working on pieces such as this one? Oh and awesome design! best of all be unique as much as possible..
and i've never used that in a compliment/comment before...so that's really sayin' somethin'. well they use in referance to typography..
Holy cow you're getting awesome! Love the 2D on this piece, you've even really improved in that area too!! !